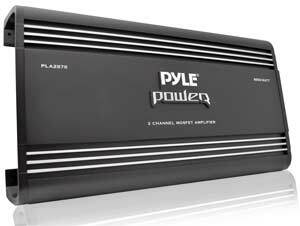 The Pyle Power Series Amplifiers will provide your audio setup with a powerful new sound. Add performance and quality enhancement to your music when you upgrade your audio system with these rugged and high-efficiency amps. Enjoy tomorrow’s advanced sound technology that outperforms all other amps in its class. 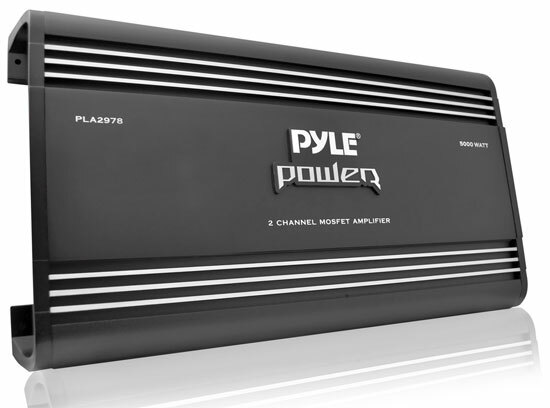 This lineup of Pyle Power amps raises the bar when it comes to true sound quality. Get that sound you’ve been looking for with crisp music reproduction for any mobile audio environment. These high-efficiency amplifiers host impressive power output wattage and are where form and function meet. Enjoy sound and performance enhancing features like Ohm specific stability, Mosfet power supply, PWM (Pulse-Width-Modulation) System, Glass Epoxy PCB, silver RCA inputs, custom terminal blocks for speaker connections, strong frequency response, and input impedance rates along with plenty more features that make the Pyle Power Series Amplifiers stronger than the competition. Take advantage of the Bass EQ Boost and turn it up. Make adjustments to the Bass EQ settings until you achieve that extra amount of kick you’ve been waiting for. The jet-black design leaves a clean finish on the fortified aluminum heat-sink. The stream-lined and high-tech appearance will definitely add some muscle to your audio. Phase - Allows you to change the relative time that the waveform meets your ear. With standard subwoofer installations where the subwoofer is behind you, the phase should generally be at O. When subwoofers or woofers are in the kick panels or door panels, an adjustment is useful in delaying the timing of the wave meeting your ear. Low-Pass Filter - Filters high frequencies out of the music and improves efficiency and sound quality by allowing only the low frequencies to pass to the subwoofer. Sends only low frequency information to particular speakers. 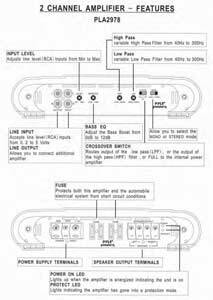 Low Pass crossover activation is usually desired if you intend to power subwoofers. Bass EQ - Variable from a range of decibel adjustments, this feature regulates the impact of your bass kick. You’ll have manual control over balancing and correcting the frequency range of a given sound. 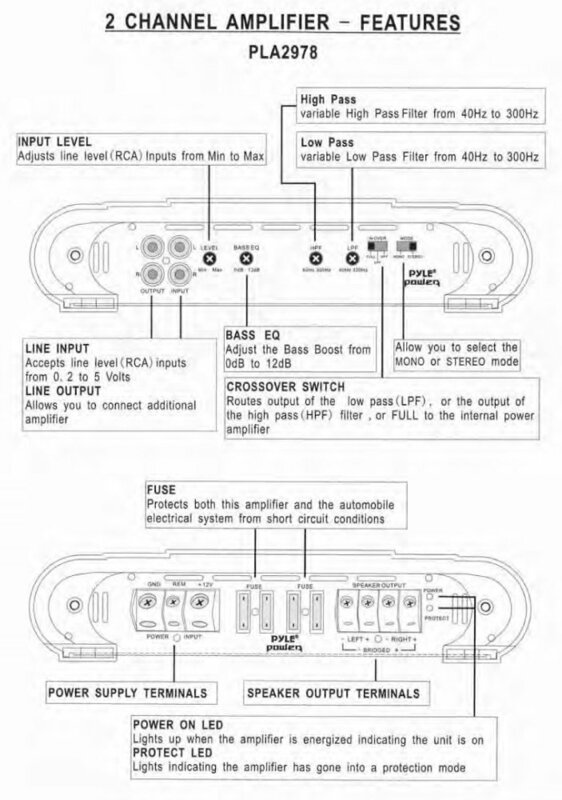 These amplifiers have inputs for Low Level input connections. The Low Level signal is carried through RCA connection cables. Which Pyle Power Series Amplifier is Right For You? When power isn't enough, you need Pyle Power. This two-channel, 5000-watt power supply is bridgeable. It's equipped with everything you've come to expect from quality car amplifiers. The RCA ports are silver-plated for eliminating signal loss. A subsonic filter allows low-end interference to be cut, so your speakers will always be delivered the highest quality audio. The MOSFET pulse width modulation power supply allows for a clean, distortion-free signal to your speakers. To keep both your car and the amplifier safe, this model is equipped with thermal, overload, and short circuit protection. So when what you need is power, trust Pyle Power.